The XVIth Warrior Blog: Exclusive Members offer! 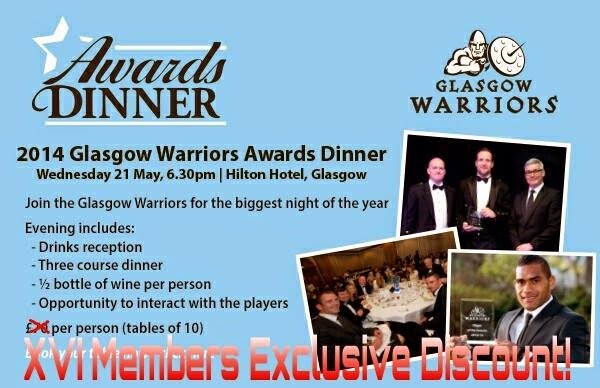 We have extended the deadline for the exclusive discount for the 2014 Glasgow Warriors player awards. The XVIth Warrior members can book a place for £55.00 instead of £75.00! That's a massive £20.00 off! The night starts at 18:30 on Wednesday 21 May at the Hilton Hotel Glasgow. Your ticket includes a drinks reception, 3 course dinner, 1/2 a bottle of wine per person and time to interact with the players in a more relaxed setting. Contact us via the usual channels and we will confirm your booking. Places are booked on a first come first serve basis.